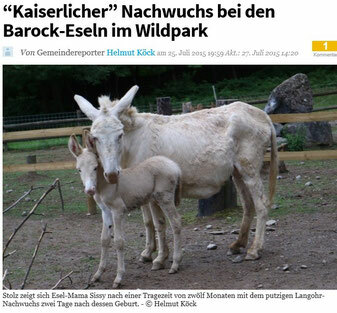 Herzliche Gratulation an den Wildpark Feldkirch, unserem neuesten Mitglied im Verein, zu dem wunderschönen Hengstfohlen, das Ende Juli gesund zur Welt kam. Für den Wildpark ist es das zweite Fohlen in Folge, nachlesen können Sie hier. It's awesome to go to see this website and reading the views of all friends about this article, while I am also zealous of getting knowledge. You're so interesting! I do not suppose I've read through anything like that before. So great to discover somebody with a few unique thoughts on this subject matter. Really.. thank you for starting this up. This web site is something that's needed on the web, someone with a little originality! I have read so many articles or reviews about the blogger lovers except this piece of writing is actually a nice piece of writing, keep it up. My brother recommended I may like this blog. He used to be entirely right. This post actually made my day. You cann't believe just how much time I had spent for this information! Thanks! You're so cool! I don't suppose I've read through anything like that before. So great to discover someone with some original thoughts on this subject. Really.. thanks for starting this up. This site is one thing that's needed on the web, someone with a bit of originality! Thankfulness to my father who shared with me concerning this weblog, this weblog is in fact amazing. Hey there, You've performed an excellent job. I'll definitely digg it and for my part recommend to my friends. I am sure they'll be benefited from this site. Hey there excellent blog! Does running a blog such as this take a lot of work? I have very little understanding of programming but I had been hoping to start my own blog soon. Anyway, if you have any ideas or tips for new blog owners please share. I know this is off topic nevertheless I simply had to ask. Cheers!